Being a professional cabinet maker, I know the tricks of the trade. Fastening a pullout trash can assembly to a cupboard door can be tricky. There’s a method that works perfect every time. The screw holes on the adjustable mechanism are not aligning where I can fasten it to the cabinet door. In other words, it is in alignment with where the shallow or skinny part of the door’s raised panel is. You will need to have a sub-panel made that will fasten to the roll-out trash can brackets and then fasten the decorative oak, cherry, maple raised panel door or shaker style to that. Where will I get this additional piece of wood? From a cabinet company of course! The secondary piece of wood would be aligned with the face of the cabinet frame. 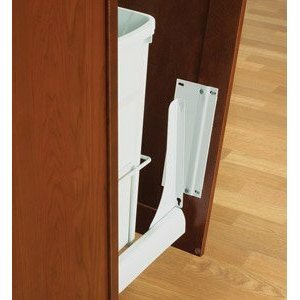 You can install the pull-out so that the additional panel is just a little inside of the cupboard from being flush in the front, like one sixteenth of an inch (1/16”). This will give you a little additional adjusting room. Actually, it will eliminate most of the possibility of you installing the slide-out too far forward. Once the sub-door panel is fastened on and the roll-out trash assembly is installed in the cupboard, determine where your decorative kitchen cabinet door should be fastened on the panel. Make marks on the decorative kitchen door where the sub-panel should be screwed on. Then, place the door face down on a soft cloth, remove the roll-out and align it with your marks. Screw it fast with an electric or cordless drill. 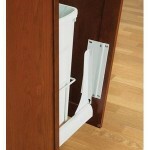 Once you are finished fastening it secure, install the pull-out into the cabinet. 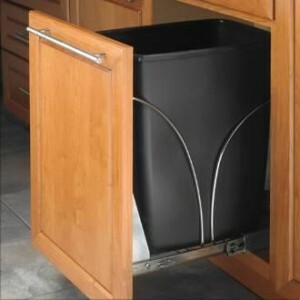 Then, use the adjusting parameters on the hardware of the roll-out trash assembly to get the door in perfect alignment. 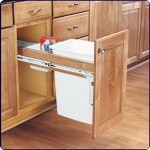 Adding a door mounted trash can to your kitchen cabinets adds value and convenience.